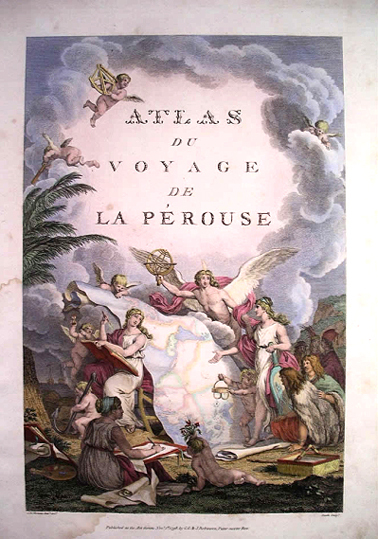 The first edition was published in Paris in 1797 in four quarto volumes with an accompanying folio atlas containing 69 plates, maps and plans. The Voyages of La Pérouse is one of the most iconic, though one of the most poignant, publications in the history of exploration. Although La Pérouse's expedition was lost, his journal and records survived. Whenever opportunity arose, personal letters and documents were forwarded to France. The first instalment was sent by sea from Macao; the second (Macao to Kamchatka) travelled overland with Barthélémy de Lesseps, who arrived in Paris on 17th October 1788 after an epic journey across Russia. The final despatches were sent courtesy of Governor Phillip from Botany Bay. See "Mail" on La Perouse Museum and Headland blog. Journal historique de M. de Lesseps, Paris, Imprimerie Royale, 1790, 2 vols. in-8. The project of publication was delayed by the Revolution. On 22nd January 1791, however, the Société d'histoire naturelle presented a petition to the Constituent Assembly. Decrees were passed ordering the journal to be published and the maps and illustrations engraved at public expense, with any profit to go to La Pérouse's widow (text of two decrees 9th February and 22nd April 1791, reproduced in the preface to the first edition). Of necessity, the redaction was left to others. 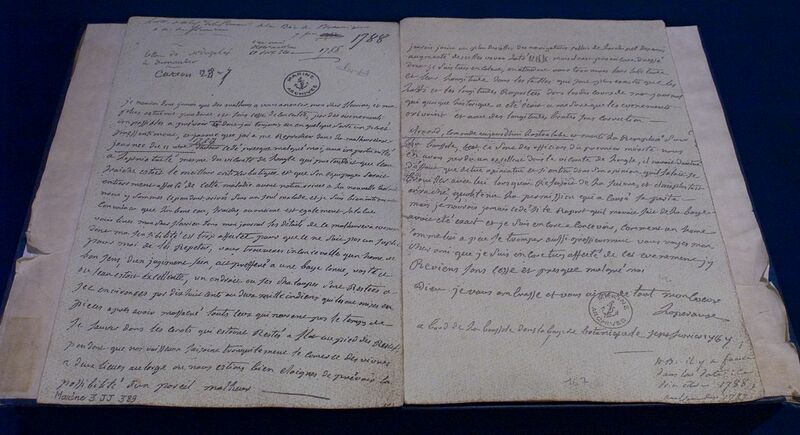 A letter from La Pérouse, again included in the preface, expressed his desire that his account should be edited by a mariner and scientist rather than a man-of-letters (iv-v). In the event, the editing was undertaken by a soldier, General Louis-Marie-Antoine Destouff de Milet-Mureau of the Corps of Engineers. He was not the first choice - for reasons that are not entirely clear the project was declined by the former minister Fleurieu, who had been instrumental in organising La Pérouse's mission. By 1793 nothing at all had been done and Milet-Mureau continued to struggle against difficult economic conditions. The political situation in France forced him to eliminate all references to Louis XVI in order to respect "the austere principles of republicanism". Nonetheless, the scholarly consensus is that he did his job well. According to La Pérouse's modern editor John Dunmore, his editorship was unintrusive and he showed commendable respect for the spirit of his original text. After the publication of the first French edition, English translations rapidly followed, with five separate editions - by Hamilton, Johnson, Lemoine, Stockdale, and a fifth by an anonymous publisher. An abridged edition was published in Edinburgh, then printed in Boston. Other editions followed:in 1799 in Leipzig, Berlin, Copenhagen and Stockholm; in 1800 in St Petersburg; in 1801 Krakow and Amsterdam; in 1815 in Milan. 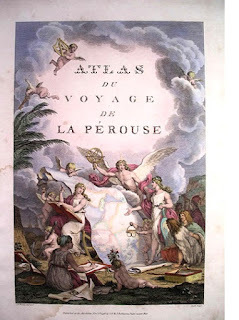 A voyage round the world, in the years 1785, 1786, 1787, and 1788, by J. F. G. de la Pérouse: published Conformably to the Decree of the National Assembly, of the 22d of April, 1791, and edited by M. L. A. Milet-Mureau, Brigadier General in the Corps of Engineers, Director of Fortifications, Ex-Constituent, and Member of Several Literary Societies at Paris. This three volume edition of 1798 by Johnson (rather than two volumes by Stockdale) is now considered by bibliographers to be the first edition. John Dunmore and Maurice Brossard, eds. Le voyage de Lapérouse: récit et documents originaux (Paris:Imprimerie Nationale 1985) 2 vols. In English: J.Dunmore,. ed. & trans. (1995) The journal of Jean-François de Galaup de la Pérouse, 1785-1788, Hakluyt Society, London. 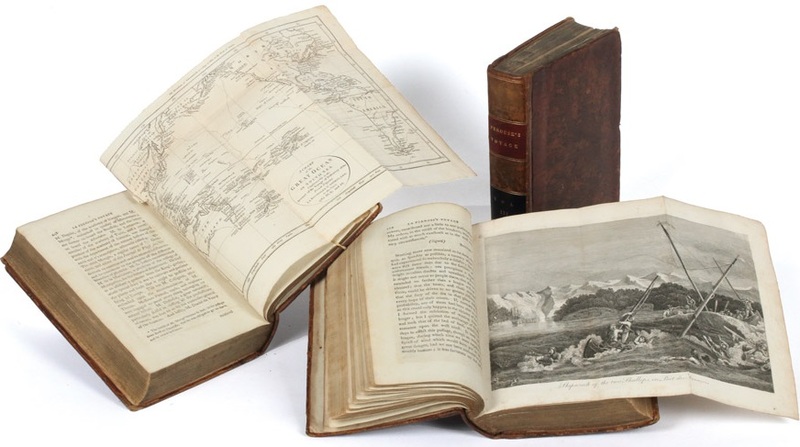 The modern edition is the work of the New Zealand scholar John Dunmore, who reveals how, remarkably, La Pérouse’s original journal was ‘lost’ in the Archives Nationales until a researcher accidentally came across it inside a volume entitled ‘Scientific discoveries’. The maps and engravings originally published as a separate folio; in the English editions they are integrated into the text. Biodiversity Heritage Library: from the original French atlas volume:. David Rumsey Historical Map Collection, Stanford University. The original copper plates for the 1796-97 Atlas were discovered in the late 1980s and found to be in excellent condition. They are now in the collection of the Musée de la Marine, Paris. A fine hand-coloured copy of the Atlas, struck from these original plates was presented to the La Perouse Museum in Botany Bay in 2003. Facsimile of La Pérouse's last known letter in the archives Nationales de la marine. Forty-five years ago, I made a discovery that changed my life. I found that I could read the accounts of voyagers to the Pacific and Australia - Cook, Banks, Bligh, Bougainville and all the others and their companions - not so much for what they themselves did as for what they saw. I wanted to see what they saw, to write two-sided history - the histories of the indigenous peoples and of those who intruded upon them. Of course, writing two-sided history is not easy. It means looking through the eyes of men who could not see what they were looking at. In that there was an inevitable but wonderful diversion. One had to pause a little to look at the seers to catch their way of seeing. There is always a moment of performance consciousness among these many discoverers in the Pacific. It is the moment when they discover that being a 'discoverer" is a performance in public. It is the moment when they discover that they are writers. James Cook can be our example. During that remarkable feat of voyaging along the two thousand miles of the eastern coast of Australia, he reflects in his journal on how much theatre there is in discovering. As commander, he knows he always has the decision to make between adding to discovery or prudently avoiding dangers. Fame or foolishness is his constant dilemma. The viewers of his performances will always have the advantage of hindsight. But he knows that will not save him. The ambiguity of interpretations is his constant companion. That realisation clearly softens the perspectives of his cultural perceptions for a time. He wonders at his certainties - about material simplicity and cultural complacency. He observes the Aborigines of New South Wales and wonders whether he really has anything to give them.When these discoverers discovered that they were writers- that their words would one day have an audience - they shared a common concern. They were preoccupied with the question of the language with which they would engage the spectators of their experience. They saw their own language as plain, direct, unelaborated with metaphor, allegory or style. Sometimes they were archly modest about how ordinary they were, but mostlly they were passionately defensive of an offering of their witness that was in properly bland monotone. There was as well more thanaa suggestion that such a language was appropriately manly. Style was clearly seen as feminie. La Perouse spoke for them all. He had pre-empted the possibility that all his discovering might be lost by sending home copies of his journal halfway through his ovoyage in 1788. He was not the first author to speak to a future editor from the grave. Above all, he instructed that the editor not be a ' man of letters'. A man of letters, he wrote, will either sacrifice the proper terms which the seaman and man of learning would prefer, but to him with appear barbarous; or respecting all the nautical and astronomical detail, and endeavouringto make a pleasing romance, he will commit mistakes for want of the knowledge his education has not allowed him to acquire which may prove fatal to those who follow me'. La Perouse wanted an editor versed in mathematical science, one who would respect the 'rude but coarse style of a seaman'. All the 'experimental gentlemen' who accompanied the discoverers on their expeditions, had Linnaeus and Buffon for their models. These navy men had the example of their own sailors' language, brilliantly economic and precise. This language, they thought, made their observations factual. It was the pledge of their objectivity. I soon had heroes in my endeavours to write two-sided history. They were not those whom you might think. They were the editors of these many discoverers' journals. Above all, they were the editors of that great voyaging society for readers, the Hakluyt Society. In 1995, I added another hero to my list, John Dunmore. Jean François de Galaup, de La Pérouse had deep anxieties about who would edit his papers. Ge had seen the troubles James Cook had had when a 'man of letters'. Dr John Hawkesworth, tried to make literature out of the ordinary words of seamen. La Pérouse must be happy in his watery grave off Vanikoro in the Solomon Islands that he has ended up in the hands of the doyen of French historical scholarship in the Pacific, John Dunmore. Dunmore has been to French explorers what J.C. Beaglehole and Bernard Smith have been to the English - meticulous master of detail, humane, exhaustively contextual, of wry good humour. A translation and edition by Dunmore of the original journal of La Pérouse in the magisterial Hakluyt Society Series is something to celebrate. It is the unfinished journal, of course, that Dunmore publishes in English for the first time. (He had published a French edition with Maurice de Brossard in 1985.) And it is from manuscripts long 'lost', in the way manuscripts are sometimes lost in archives - by being filed anomalously as 'Scientific Documents' that the publication is made. The journal ends with a sentence written at Botany Bay: 'Later we had only too many opportunities of obtaining news of the English establishment where deserters caused us a great deal of trouble and inconvenience, as we will explain in the next chapter'. The next chapter was to be sent off from some safter place for the French tro comment on the English than Botany Bay, but that place never came. A cyclone, or other terrible force of wind and water, as we can infer from some brilliant underwater archaeology, drove the Astrolabe and Boussole against the reefs of Vanikoro, and 199 men perished. By then the expedition was nearly three years long. Begun with the deepest admiration for what Cook had done and the way that he had done it, the expedition ambitioned to complete what he had not done. So La Pérouse made two great circuts of the North Pacific, one east round Alaska and California, one west around the Philippines, Korea, Kamchatka. Instructions came to him in Kamchatka to check the English settlement at Botany Bay. He sailed there by way of Samoa, Tonga and Norfolk Island. They had suffered two disasters on their journeys. Sixteen men had been drowned in an accident at Lituya Bay on the northwest coast. Twelve men had been killed by the Samoans on the island of Tutuila. The expedition came to Botany Bay depressed and weary, and in need of supplies that the five-day-old settlement could not afford them. 'Captain Honter', in any case, was off to Port Jackson. The six-week stay of the French at Botany Bay seemed more permanent to the Aborigines than had been the English stay, and they did all in their power to see the French gone. There is some suspicion, as Dunmore sees it, that the catholic priest, Claude-François-Joseph Receveur, who died and was buried at Botany Bay, had been wounded in one of these exchanges. There is a tone and character in the writings of La Pérouse's journal that makes it distinctive. Milet-Moreau, to whom was given the task of publishing the journals that La Pérouse had sent home by different methods, was neither a 'man of letters' nor a geographer. He was army. In a time of revolution he was under considerable pressure to be politically correct. So any reference to the King, Louis XVI, in the original manuscript was expunged. Like George III, Louis had taken a spirited interest in his nay's exploratory expeditions. His knowledgable comments are to be found in the margins of La Pérouse's instructions. Indeed, one of the last questions Louis asked on the eve of his execution was 'Is there any news of La Pérouse?" Milet-Moreau stiffens the prose, too. Listen to the beginning of La Pérouse's preface. It is one of the great prefaces of exploratory literature. Two of these 'natural features' can be noted. One is when La Pérouse refuses to take possession of the island of Maui in Hawai'i. The other was when he was contemplating how he should react to what he thought was the treacherous killing of his closest friend of thirty years, Fleuriot de Langle, at Tutuila. He refused to fire indiscriminately on the Samoan canoes: 'I was afraid to attack the wrong victims and the call of my conscience saved their lives'. There are not many refernces to conscience in the literature of exploration. La Pérouse, as Dunmore is at paints to point out, was no great believer in the 'Noble Savage'. Like Cook, La Pérouse had some disdain for the 'philosophers' at home and the 'experimental gentlemen' in his Great Cabin who romanitised the lives of the peoples he 'discovered'. Int he darkest moments of his voyage, as he makes his way to Botany Bay after the killing of his men, he says he will do his duty as a geographer and describe the various islands he visits but he 'left to others the task of writing their history which like that of all barbarous peoples is of slight interest. A 24-hour stay with an account of our misfortunes is sufficient to describe their atrocious ways, their crafts and the products of one of the most beautiful countries in the world'. Ah well! He was not the first, and wold not be the last, to despair at the possibility of writing cross-cultural history because of the violence in herent in the encounter. Greg Dening, "Writing what the eye sees" in Readings/Writings, 1998, p.41-47.